Transform your organization’s approach to technology and innovation across logistics and the supply chain. In this program designed for senior leaders in defense and business, you will learn new tools and techniques for innovative thinking. Return to your organization ready to implement strategic direction that leverages your people, processes, and technology to deliver effective, efficient logistics and supply chain capabilities. Collaborate with peers from diverse organizations across the public and private sector to address shared challenges from a big-picture perspective. Led by expert faculty and industry practitioners, you’ll learn strategies for successful implementation and adoption of new technologies at the strategic and operational levels. 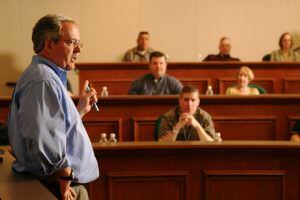 LOGTECH Executive is taught workshop-style using a combination of lectures, guest speakers, panels, and in-class exercises. To ensure our LOGTECH programs continue to address timely, relevant logistics and technology topics, the IDB appoints 28 LOGTECH Subject Matter Experts (SMEs) to provide feedback on program curriculum. These SMEs hold top logistics and supply chain positions across private industry, government agencies, all military services, and academia. They meet once per year during a Feedback Forum to share views on the current and future state of logistics, supporting technologies, and key strategic challenges. Ideal candidates include general officers, SES government civilians, and private sector executive leaders. Professionals and organizations interested in this program should contact IDB Senior Account Manager, Mike Bogdahn at bogdahn.ctr@idb.org or (760) 577-8324 for enrollment information. The LOGTECH Executive program begins Monday evening with an opening dinner reception and concludes by 1pm Friday afternoon. Classes during the week typically begin at 8:00 am and conclude by 5:00 pm, along with evening events with an open night on Wednesday. For a detailed overview of the week, download this sample schedule. UNC’s Paul J. Rizzo Center at Meadowmont in Chapel Hill provides an outstanding and comfortable learning environment plus the resources to allow participants to learn, build relationships, and relax in one self-contained residential executive education facility. All guest rooms offer a desk and lounge chair, high-speed Internet and WiFi access, communication port for laptops, hair dryer, iron and ironing board, and cable television. Washer and dryer facilities, dry cleaning valet services, and a full-service business center are also available, along with 24-hour access to fully stocked snack pantries. There is a small gift shop in McLean Hall that offers personal items and UNC paraphernalia. Recreational facilities include a fitness center with aerobic and weight-training equipment, a sports bar with two professional-size billiard tables and a foosball table, a basketball court, a sand-pit volleyball court, an outdoor heated pool, and jogging trails. To maximize the benefits of the collaborative environment of the program, we strongly discourage participants from bringing spouses or other guests.